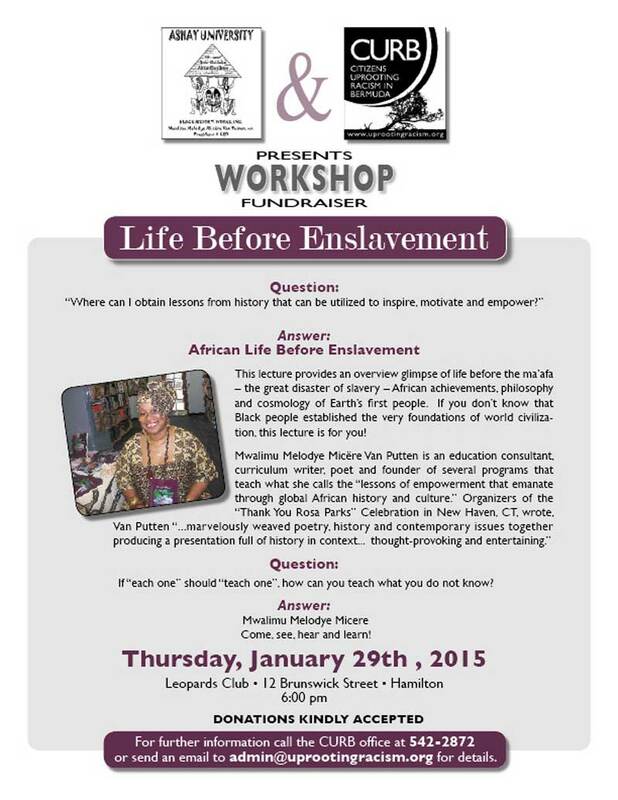 Citizens Uprooting Racism in Bermuda [CURB], in partnership with Ashay University founder Mwalimu Melodye Micere Van Putten, is getting set to host a workshop overview on the topic of ‘Life Before Enslavement’ on January 29, 2015 from 6.00pm through 8.00pm at the Leopard’s Club. Donations will be accepted at the door, allowing those in attendance to support CURB and its endeavors. Professional Development certificates will also be available at a cost of $20 each. I bet they will be packed to the rafters for this one. Sadly I am clipping my toe nails. I hope it will be packed to the rafters, so much of the history of the melinated people in the west has been stolen and manipulated.. We have to ponder ; if eveyone is supposed to be getting along, then why aren’t we and what is the problem…Hopefully these lessons and information will help solve our puzzle of why we have always been enslaved, and the works we have done and continue to do or consistently ignored for its true value..